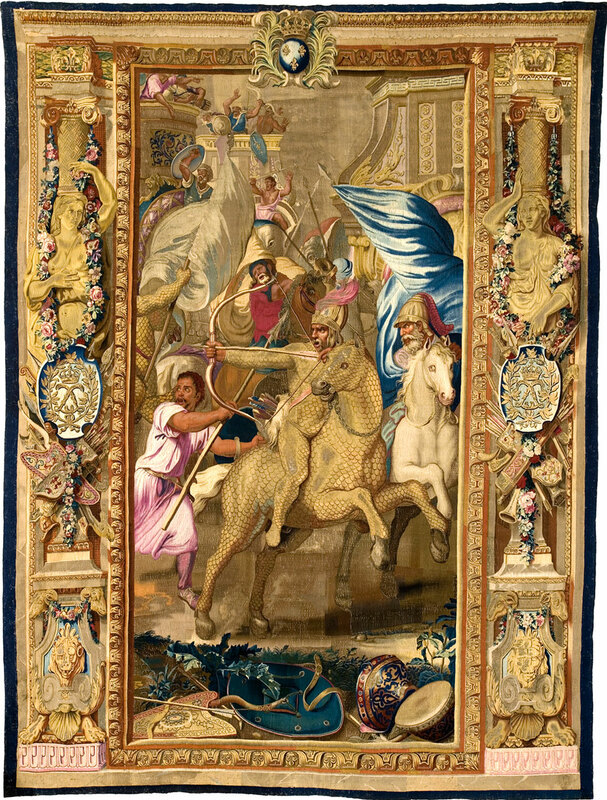 Woven Gold: Tapestries of Louis XIV exhibition. Gallery view of J. Paul Getty Museum, the Getty Center. 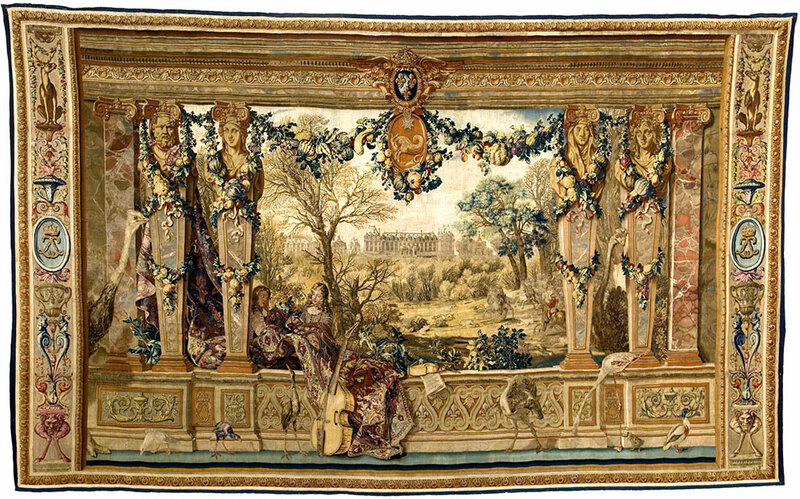 The art of tapestry weaving in France blossomed during the reign of Louis XIV (r. 1643-1715). and rich imagery of these monumental works of art. When Louis XIV assumed independent rule at the age of 22, the tapestry holdings of the Crown were exceptionally rich and splendid. 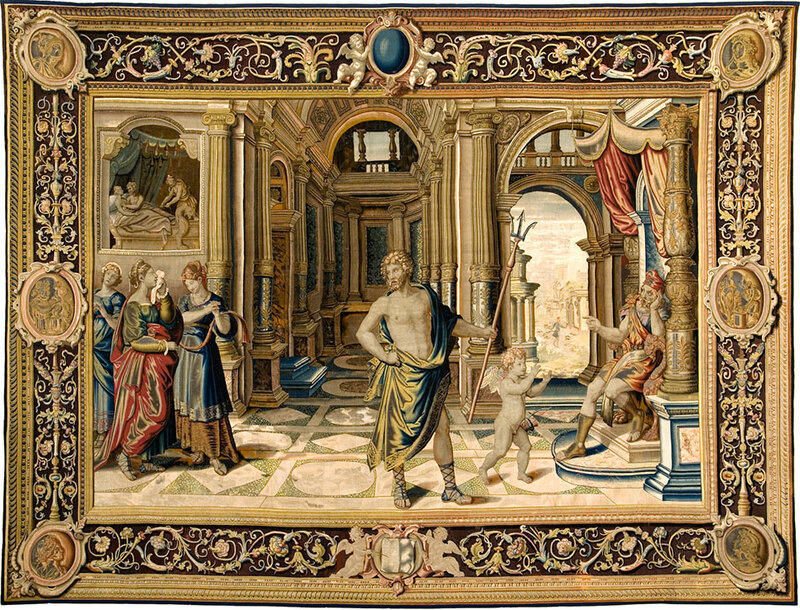 Nevertheless, Louis’s own taste and aspirations for the monarchy prompted him to augment the collection, and his agents actively pursued the great 16th- and 17th-century sets of tapestries as they became available on the art market, favoring those after the designs of Raphael. 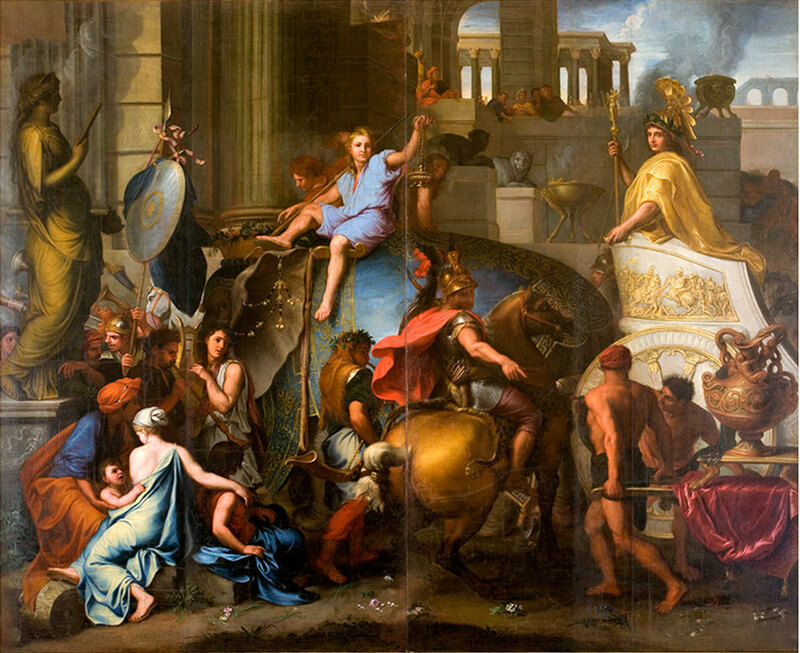 Through these valuable acquisitions, Louis XIV effectively brought the art of Renaissance Rome to the heart of the French realm. In the hierarchy of court art, colorful and glittering tapestries–handwoven after designs by the most renowned artists were the ultimate expression of status, power, taste, and wealth. 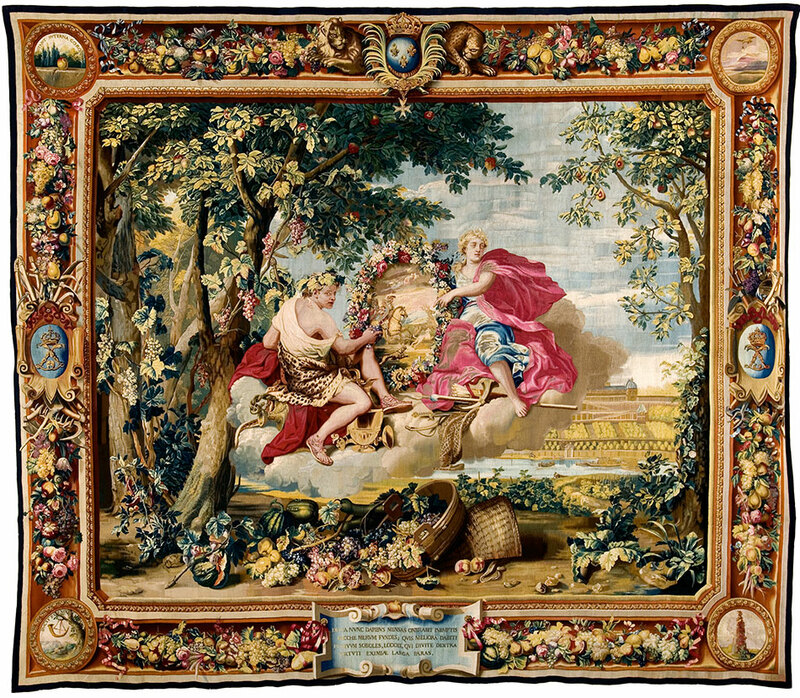 The exhibition feature monumental tapestries ranging in date from about 1540 to 1715 and created in weaving workshops across northern Europe as well as one modern tapestry. In 1666 the royal inventory of tapestries comprised 44 extremely valuable sets, woven with profuse quantities of precious metal-wrapped thread. 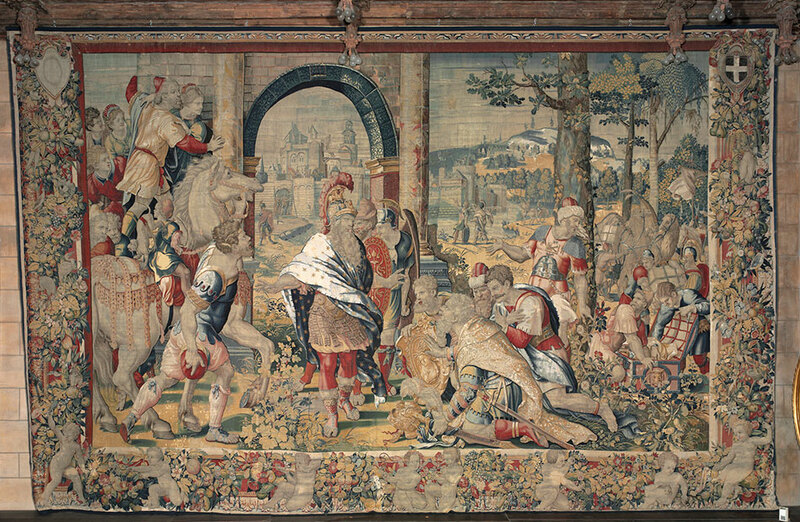 This collection of illustrious but aging medieval weavings had been complemented by the additions of highly important Renaissance hangings acquired by François I. 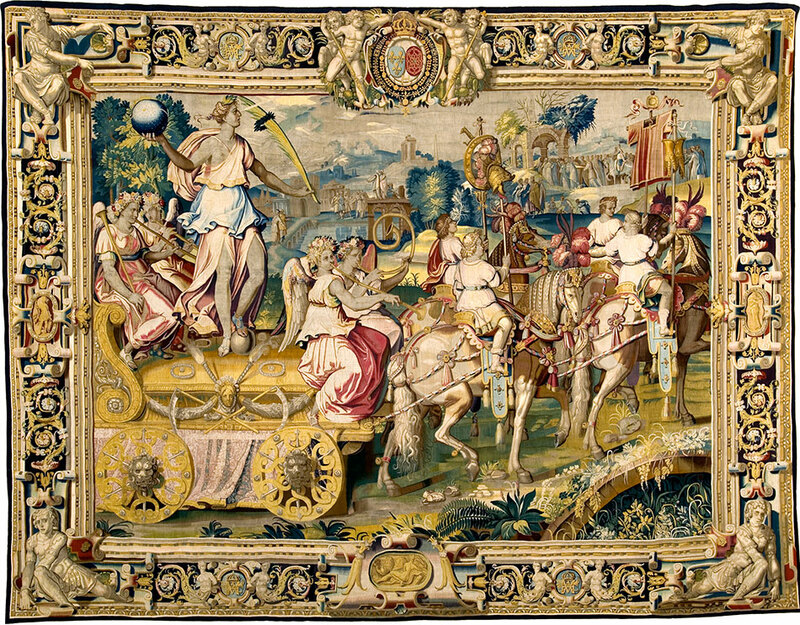 Until about 1600, the most prestigious sets, especially the more costly ones portraying human figures, came from the powerful network of well-financed tapestry merchants in Brussels and Antwerp. 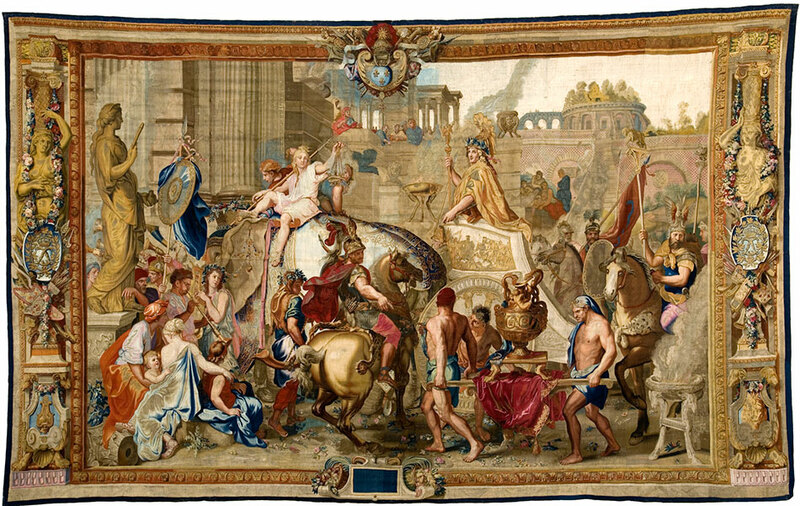 At that time, the French tapestry industry was weaker and less efficient than its northern competition. From the turn of the 17th century, however, King Henri IV (reigned 1589-1610) built up the domestic industry in an attempt to turn the luxury textile market to the kingdom’s advantage. 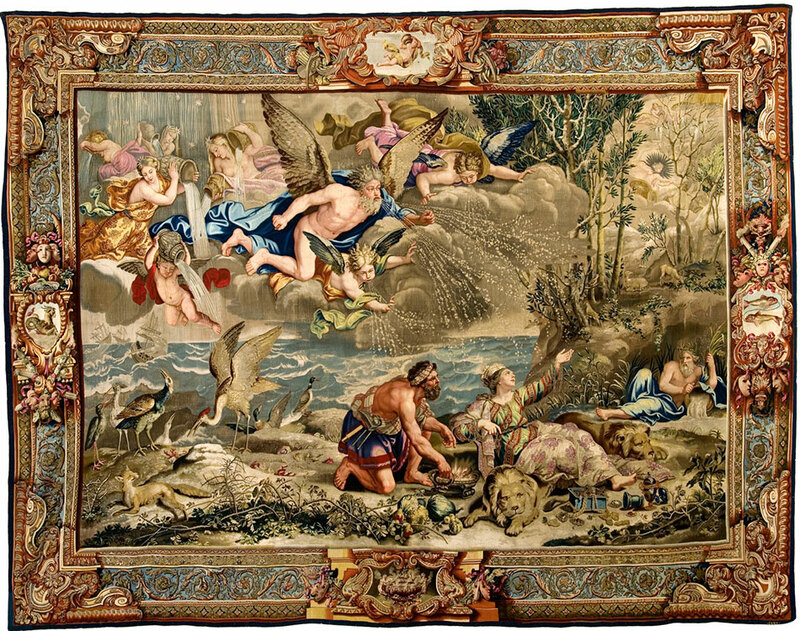 Parisian workshops began to flourish and, increasingly, more French weavings entered the Crown’s collection. A half-century later, Louis XIV, grandson of Henri IV, inherited this rich patrimony. 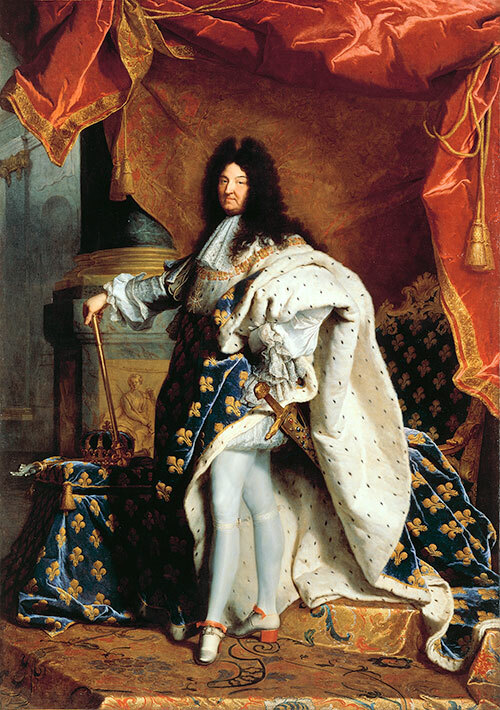 After Louis XIV assumed independent rule in 1661, he employed the literary, visual, and performing arts to glorify the monarchy and to aggrandize his public persona. As the ultimate patron and protector of the arts, he founded new academies and manufactories to serve these objectives and to promote his reputation as the arbiter of informed, refined taste. 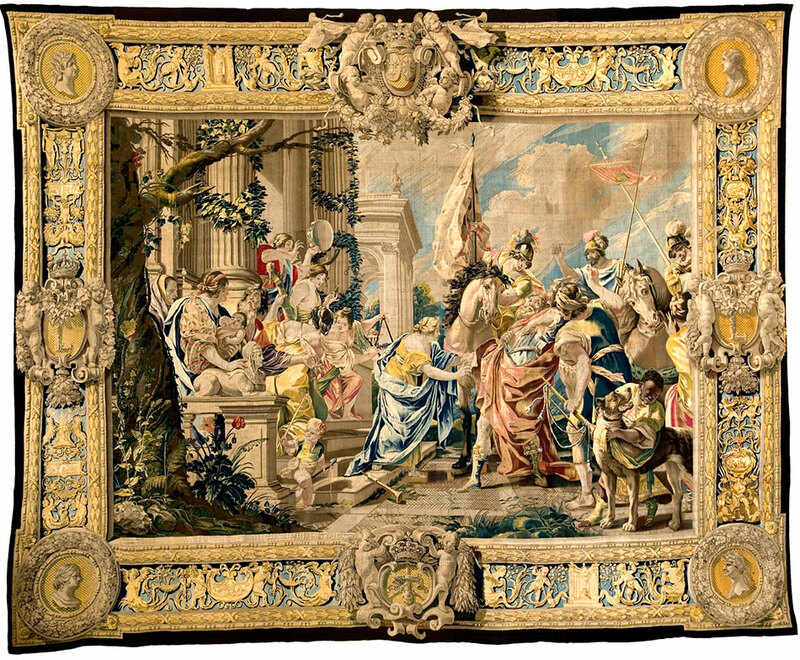 Concerning the medium of tapestry, that costly and prestigious symbol of royal power and aesthetic discernment, Louis XIV approved the centralization of the sundry Parisian weaving workshops into one large unified complex at the Hôtel of the Gobelins in the Faubourg Saint-Marcel, then a suburb southeast of the city wall. 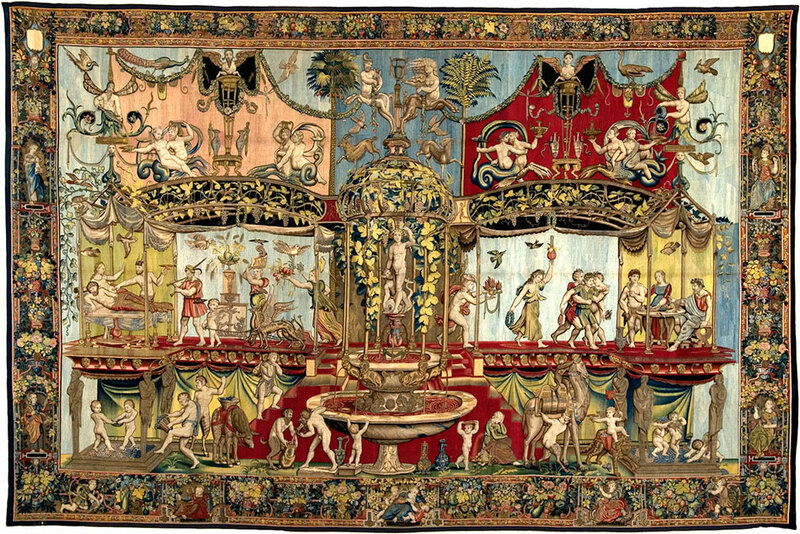 Thus, in 1662, the Royal Tapestry Manufactory at the Gobelins was established to produce extremely high-quality tapestries after accomplished designs for the adornment of royal residences. The manufactory fulfilled its mandate, to great success, over the course of the next fifty years of the reign—and indeed beyond, for the Gobelins manufactory continues to operate. In the hierarchy of court art, tapestry was regarded, historically, as the preeminent expression of princely status, erudition, and aesthetic sophistication. Extraordinary resources of time, money, and talent were allocated to the creation of these works meticulously woven by hand with wool, silk, and preciousmetal thread, after designs by the most esteemed artists. The Sun King, Louis XIV of France (born 1638; reigned 1643–1715), formed the greatest collection of tapestries in early modern Europe. By the end of his reign, the assemblage was staggering, totaling some 2,650 pieces. Though these royal hangings were subsequently dispersed, the largest, present repository of Louis’s holdings is the Mobilier National of France. 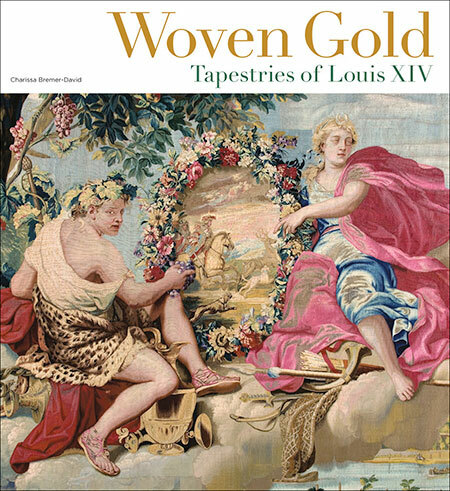 With rare loans from this prestigious institution, Woven Gold: Tapestries of Louis XIV explores and celebrates this spectacular accomplishment. This exhibition was organized by the J. Paul Getty Museum in association with the Mobilier National et les Manufactures Nationales des Gobelins, de Beauvais et de la Savonnerie. We gratefully acknowledge the Hearst Foundations, Eric and Nancy Garen, and the Ernest Lieblich Foundation for their generous support.